The following description contains important information and several photos. All photos show my actual work, and are all babies that were made by me. 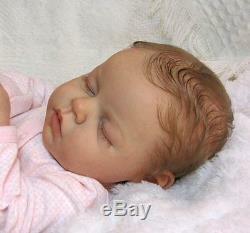 I NEVER use stock photos, and I have been making reborn dolls since 2004. 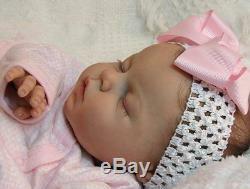 This listing is for a custom order reborn doll. All of the photos shown are babies that were actually made by me, I only show photos of my own work. 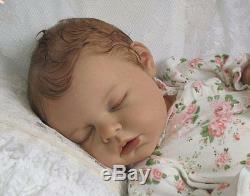 Custom order for Beautiful Reborn Noah doll. This listing is for a baby to be completed mid to late November 2017. Please read full description for all details. Reborn b y professional reborn artist since 2004. 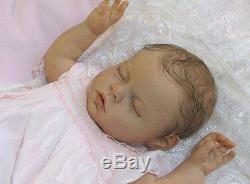 Noah kit by Reva Schick will be used to create reborn doll. 3/4 arms and full legs. Micro-rooted premium mohair in your choice of color. Natural looking manicure on finger and toenails. Weighted with the finest round glass beads and polyfil. Open nose backed with felt. Outfit set (chosen by artist). Optional Magnetic Hair Bow (only if requested). Optional Magnetic Pacifier (only if requested). 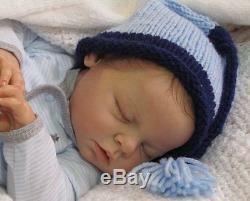 This listing is for your very own custom reborn Noah doll that will be made just for you, according to your specifications. I have included many example pictures showing some of my past work. All of the babies shown here have already been adopted into loving homes, but are pictured here to show you what your own baby could look like. 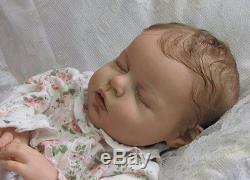 Your baby will start out as a blank unpainted vinyl doll kit. Then, over the course of several weeks, he or she will be transformed into an amazing, realistic and precious baby that you will want to cherish forever. No part of the process is ever rushed, and I only use the highest quality of supplies in creating my babies. I put many hours of each day into my reborns, and the result is a true work of art. I adore making these babies, and hope that it shows in my work. 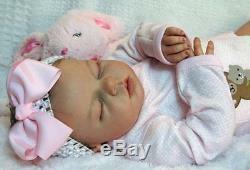 You can be assured that your baby will be a high quality reborn, that has been made by loving hands. Would you like your baby to be a boy or a girl? What hair color would you like? What is the hairstyle you would like for your baby? Do you want a magnetic pacifier and hair bow? Items that will be coming home with your baby include. Cute and Casual New Outfit. Magnetic pacifier and hair decoration (only if requested). No specific choice of casual outfit. Dressier outfits are available at additional cost. All of the photos show my actual work, and all babies were made by me. OTHER IMPORTANT INFORMATION: All pictures have been taken in natural daylight and at various times of the day, thus will be the reason for any difference is lighting. Reborn in a 100% smoke-free nursery and home. 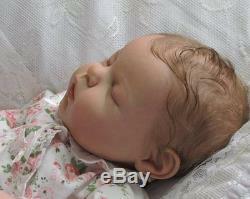 This baby is a collectible vinyl artist doll, and is usually not recommended for use as a play doll for children. It is not recommended to use baby lotions, or other products. 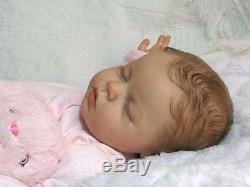 Hair around hairline is often rooted sparsely to resemble a real baby, and should be handled gently. But please understand that I cannot be on the computer at all hours of the day, as I do need time to work on my orders. I'm sorry, but I cannot give price adjustments. 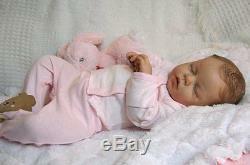 This listing is for a baby to be made to your specifications. None of the photos shown are the actual baby that you will receive. The photos are here to show examples of my past work. Photos sent after doll is completed. Please only order from me if you like my work as shown in my photos. All Baby Photos and listing graphics are property of Bushel and a Peck Nursery, and may not be used without my permission. Local pick-up is not available, regardless of location. I have no control over how long this will take. 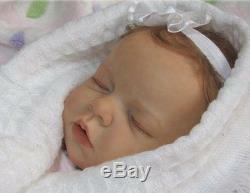 The item "Custom Order for Reborn Noah Newborn Girl Doll" is in sale since Tuesday, April 18, 2017.